Facilities include Upper Room (capacity 100 theatre style; 25 boardroom style) with multimedia facilities and coffee bar area, a range of smaller meetings rooms, and a sports hall. Kitchen and tea and coffee facilities. Facilities have full disabled access. Visits to view the facilities can be arranged by appointment. Facilities available for hire weekdays and Saturdays (not evenings). Booking form on website. Weekend bookings may incur an additional fee, dependent on other bookings. 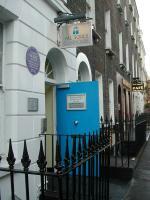 All Souls Clubhouse - an evangelical Christian organisation and community church.